It is formed by the player loaded with study abroad studying music and universities with great desire to please enjoy playing live willingly in various places, it is active in Shikoku (Kagawa) and Tokyo mainly. From (flute & piano or violin) duo, playing is possible in the organization to meet salon style orchestra (two violins, cello, double bass, clarinet, flute, piano, etc. ), to a variety of needs. It became a flute player through Takamatsu National College of Technology graduate industry , Sony headquarters Miyazawa flute work . National Conservatory of Music graduate. He studied to Messrs. Yamada, Emiko , Imokawa Nobuko , Shimizu Wa-daka , Fujita Mayori , of Sabine Seifert flute . The 29th International Art League audition pass , 2nd part of the 11th Japan Flute Convention contest ensemble universities, general , 5th French Music Competition Award . I deal with performance and planning guidance and playing around Shikoku and Kanto . 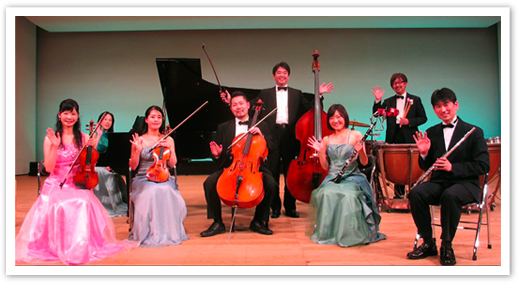 Give an exhibition of in various places funded children 's Dream Fund , the Japan Chamber Music Foundation . Also , I was in charge of the orchestra director outdoor music hall of 5000 persons , which was held in July 2011 in the local Kagawa of " Teatoron " performance . Feel the possibility to the sound of the frying pan that I saw by chance in the middle of a concert you want to play with orchestra by each brought a " what sound in the house is over ", and in pursuit of a frying pan as a musical instrument . As a result, it is possible to place like a glockenspiel of the frying pan up to 21 , and make a sound of about two octaves is possible, you're playing the music of various genres . Other TV appearances in , you're playing all over the country as a child 's Dream Fund grant business .